Creativity rules the day as artists, designers and volunteers team up to bring colour and life to the hallways of the AWWA Community Home for Seniors. 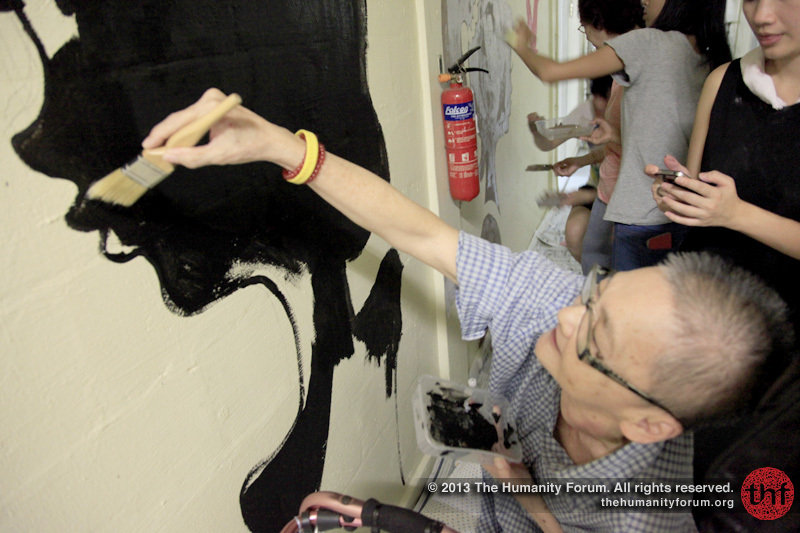 THF recently organised Project Sunshine Corridor, a design project for the Asian Women’s Welfare Association (AWWA) where colourful murals were painted along the hallways of the AWWA Community Home for Seniors at Ang Mo Kio Avenue 6 Block 123 last 31 August, 2013. 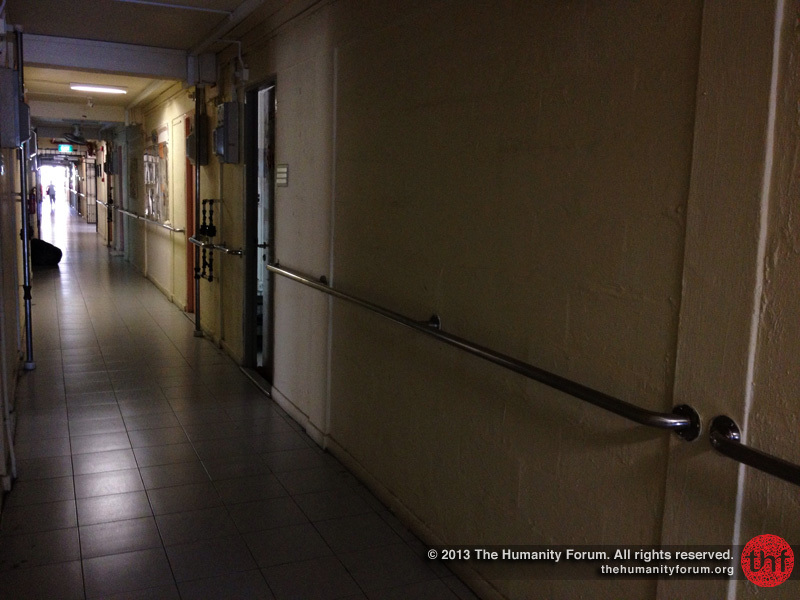 This is how it used to look like, a dark and sad corridor. This project was initiated by 3 local design agencies- w3-o design + interactive lab, Design Rules and Hatch, with the support of Swinburne Alumni Singapore, Nippon Paint Singapore (the main sponsor of the paint) and THF Friends. The effort was spearheaded by team leader and creative designer of w3-o, Willy Tanujoyo, with Trixia Yong and Nina Reyes coordinating the entire event. Project Sunshine Corridor came about from the THF belief in utilising volunteer expertise to improve the lives of others and Corporate Social Responsibility. Hence, with the combined dedication of 80 designers and non-designers, the once ordinary community, home to 139 elderly residents and their social workers, was transformed into a welcoming abode. Preparing the paint for all volunteers. Wiping up the wall, to make sure it’s clean and dust-free. From bare hallways to a vibrant area that springs of life, the atmosphere of the home was transformed under the original stencil designs and painting efforts. According to Joseph Reyes, a volunteer, Project Sunshine Corridor was “fun and fulfilling. Intermingling with the elderly folks definitely made it a very rich experience”. 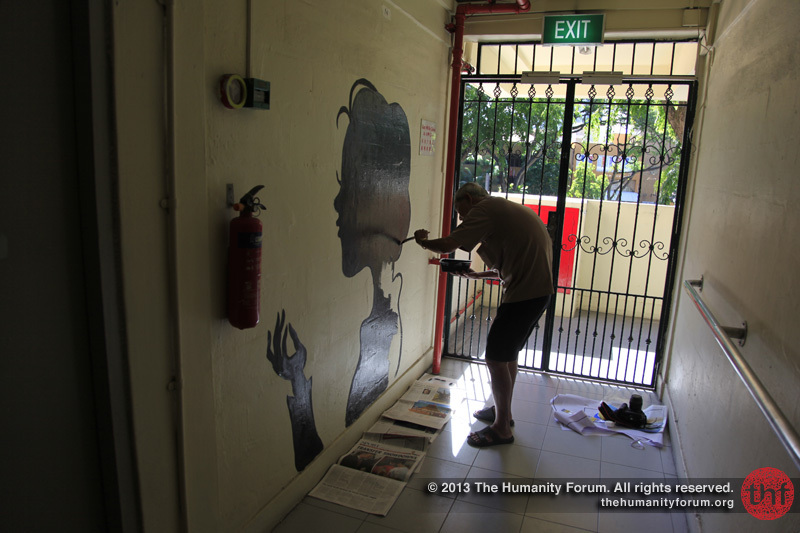 The stencils were painted on 3 separate HDB hallways consisting of 51 housing units spanning over 400m in length. Each hallway was headed by a creative designer- Willy Tanujoyo from w3-o design + interactive lab, Patricia Chow from Design Rules and Andrew Cheong from Hatch. All three carried out a different theme-based stencil design. Ms. Chow described this technique as an acquired skill, “The more you do, the better you’ll be. 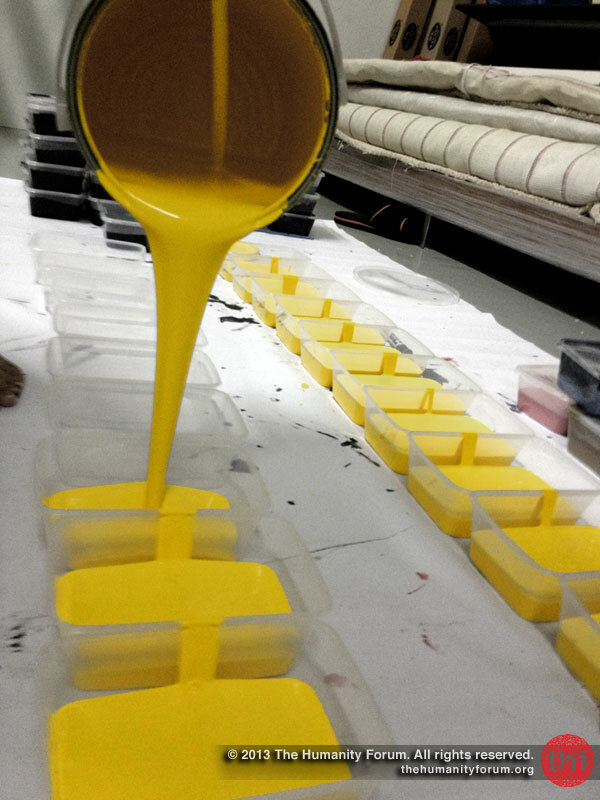 I chose the cultural aspect for my stencil theme because the memories are dear to the old folks”. The varying themes ranging from cultural (Chinatown and Geylang Serai motifs) to light-hearted (ballerina, hearts and playful cat motifs) and to joyful (clouds, bird and flower motifs) might have seemed contradictory. However, with the murals finalised, the overarching message of recreating the environment into one of warmth, was evident. An aunty tries to paint the fine edges of the illustration. Some residents turn out to be very skilful in painting. Final touch on vintage movie poster frame. 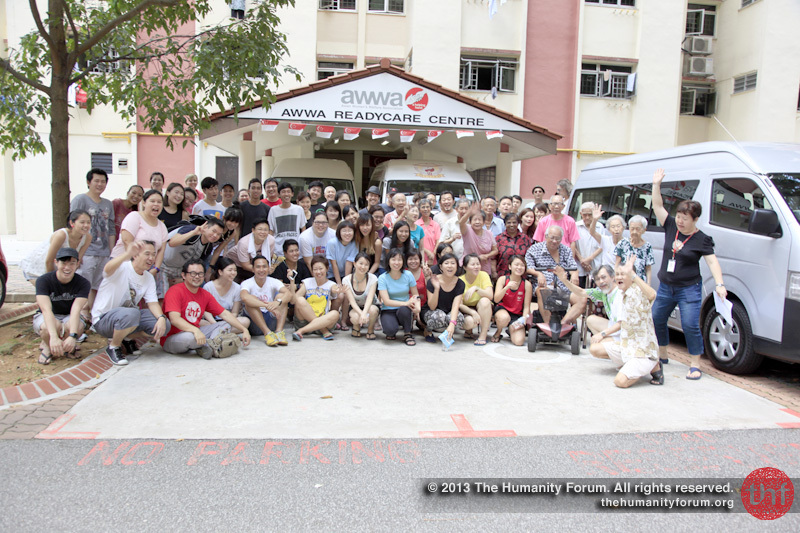 Ms. Seah, one of the elderly folks at AWWA noted that she was, “very touched by the mural paintings”. Other seniors chimed in as well, with Ms. Lee stating, “I loved the mural paintings on the 2nd floor – that reminded me of the place I had visited like Chinatown and Little India”. Ms. Mui Kee also expressed her delight saying that, “the mural paintings have brightened the home and the faces of the elderly”. According to Mr. Cheong, the project was “a good cause with the focus on giving the old folks a living environment that is cheery and lively. I hope the old folks and the volunteers enjoyed what they did because all our efforts are ultimately for the old folks and being able to contribute back to society, that is important”. Based on the sentiments of the old folks, it was clear that the unified aim of the project was a success. The elderly folks surprised the volunteers and designers with their artistic edge as they played a major role in painting. This interesting revelation of the day fuelled greater interactivity between the young and the old. 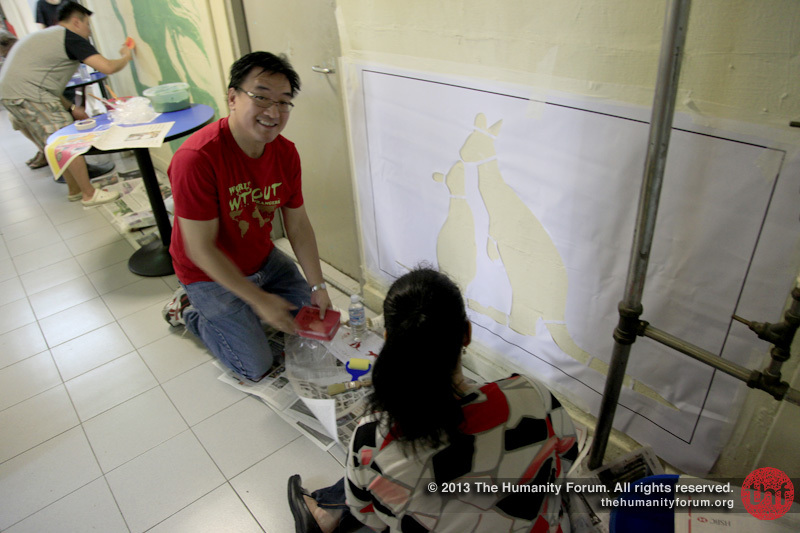 During the event, Ms. Chow stated that, “A lot of the paintings are done by the old folks and the volunteers do the touch-ups. Everyone can pitch in their creativity. Even the volunteers are getting the hang of it and getting a sense of ownership which makes it fun” – leading to the conclusion that creativity is inherent to everyone, regardless of age or experience. The cherry on top of the icing was when Ann Keong, the manager of the community home noted that Minister Khaw Boon Wan had walked through the three corridors the day after the event complimenting the hallways and general cleanliness of the place. This made it an even more memorable and successful event to be remembered in years to come. The amazing labour of love reflected the transformative power of not just charitable gestures but how art can go the distance in touching people’s hearts and minds, with the ability to change the dull into the cherished. 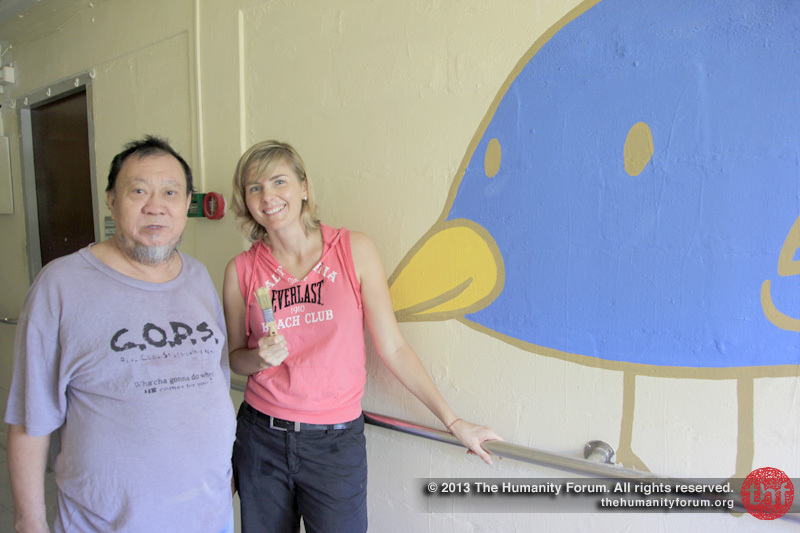 A volunteer and a resident of the home, pose with their artwork. Great team work! Some of our hardworking and happy volunteers. The Asian Women’s Welfare Association was established in 1970 as a Family Service Clinic. Presently, AWWA offers services for families, the elderly and children and young people with special needs to empower them to maximise their potential for independence. For more photos, pls visit our facebook page.